First published in 1990, this is the first book-length study of Susan Sontag: essayist and analyst if culture, author of ‘Notes on Camp’ and Illness as Metaphor, novelist, reviewer, and filmmaker. It was modernism, and the excitement it created in her, that "rescued" Sontag from childhood in Southern California and sent her abroad in the 1950s. 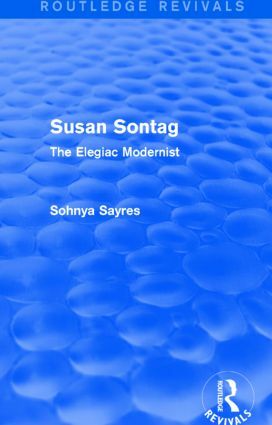 Sohnya Sayres looks into the foundations and directions of Sontag’s imposing work and in doing so discovers a unity of design and subject that Sontag has only recently acknowledged to have been an ambition all along. Sayres’s Sontag is the "elegiac modernist", committed to a modernism whose high noon has long since passed. And yet Sayres finds in Sontag’s lifelong indebtedness to modernism’s aesthetic an inherent conservatism. While guiding us through the work of a brilliant critic, Sayres questions whether Sontag is not herself caught in the paradoxes of the modernism she herself so much admires. A comprehensive analysis of the work of a remarkable intellectual, this title will be of value to any student of American modernism and literary life.